I promise you a life of love and adventure. I promise never to compare you to Barley or others who came before him. I might nudge you, but will never push you to do something you are not comfortable doing. But should you choose to ride with me, dear god the wonders I can show you! March 2016: Tulliver has helped me deal with the loss of Barley over the winter, and as the snow retreats we begin our training rides. Not often in these early days as there are still some frigid mornings to contend with, but as the sun rises earlier we give it a go. 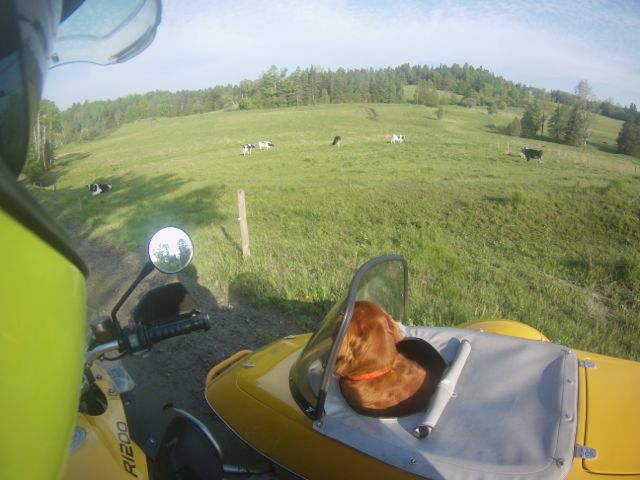 I have to remember Barley’s admonition to be patient with Tully, to remember that Tulliver is not yet an accomplished sidecar dog and might never be. And that’s okay; he will bring other gifts to the relationship. So we take it slow and easy, with me trying hard not to compare him to Barley, to see what develops. But I hope he takes to it! We did the same loop as Barley’s last ride. Huh, this isn’t so bad! Tulliver showing a bit of interest in his surroundings. He is visual, where Barley was a scent dog. Where’s this road go, Dad? Playtime at Hosmer Pond. As with Barley early in his training, I’ll make it a point to break up each ride with treats, play time and socialization. May 2016: The sidecar was down with a leaking front shock for three weeks. The offending shock was sent out to be rebuilt. Removing it wasn’t easy, requiring a few new tools and a lot of swearing, but Tulliver kept me company as I worked. And of course every time I lay on the garage floor to get a better angle at a stubborn bolt he was right there nuzzling me and trying to force the ball into my greasy hand. The rig was completely cleaned while it was torn apart, and now with a rebuilt shock is once again roadworthy. Our training rides have resumed. Tulliver is a very focused dog with fewer quirks than Barley. Tulliver is a good dog and a fantastic snuggler. He’s also extremely focused on me, something I hope to take advantage of if he decides to ride to faraway places with me. He lacks Barley’s fascination with the world in general, and in particular the creatures that inhabit that world, but that is not necessarily a minus. 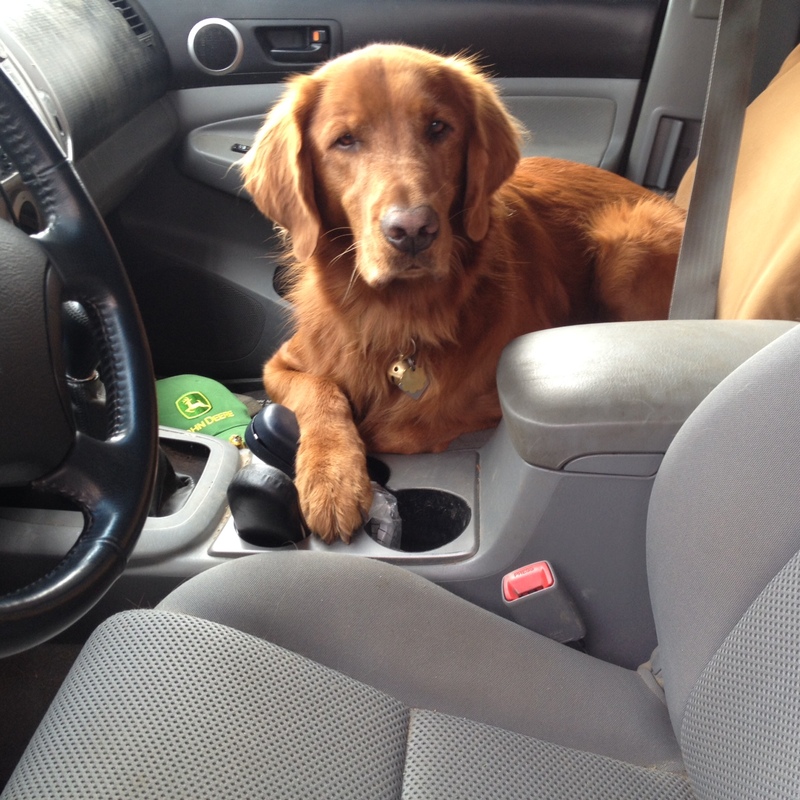 Honesty demands that I admit to having loved the way Barley studied everything with rapt attention, his muzzle pressed against the windshield, sometimes his furry head resting against my thigh while his nose worked every scent we passed through. 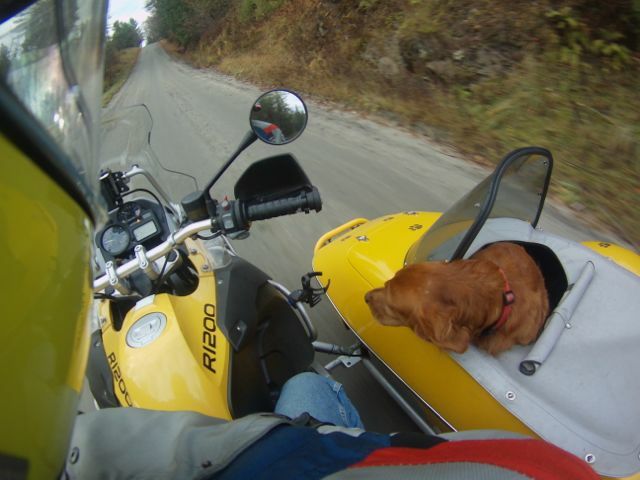 On our last long trip together, because he had just completed chemo and the drugs were still in his system, I trailered the sidecar as far as Nebraska then rode from there to the rally in Billings, Montana. My intent was to give Barley a place to stretch out full length and sleep in air conditioned comfort. But it didn’t work out that way. 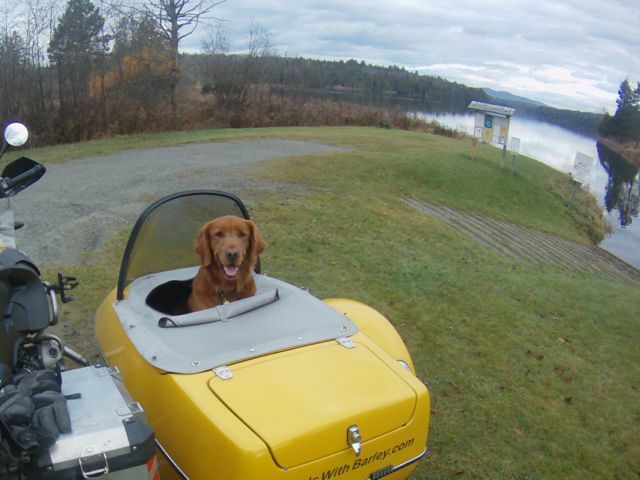 All during the trip, whether in the truck or the sidecar, he sat up to share the adventure. On the drive home he literally wobbled from exhaustion, but refused to lay down. Finally, as his nearly limp body leaned heavily into my shoulder, I pulled his head down to my thigh and held it till he slept. 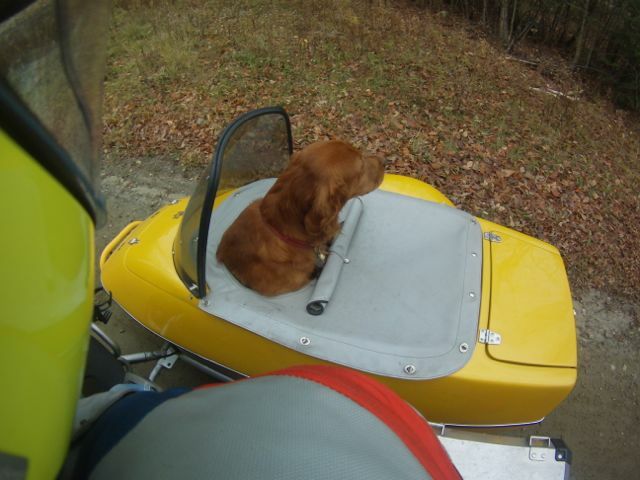 Barley was, in every way, an active participant in the adventures we shared. 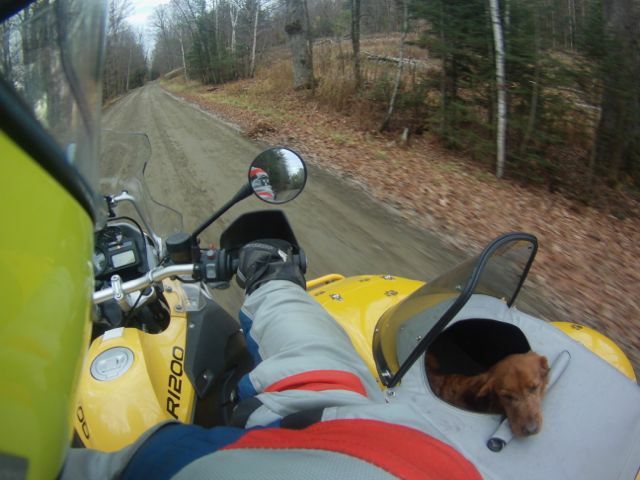 It took time and patience, but Tulliver started enjoying our rides together. He even began noticing the world around us! 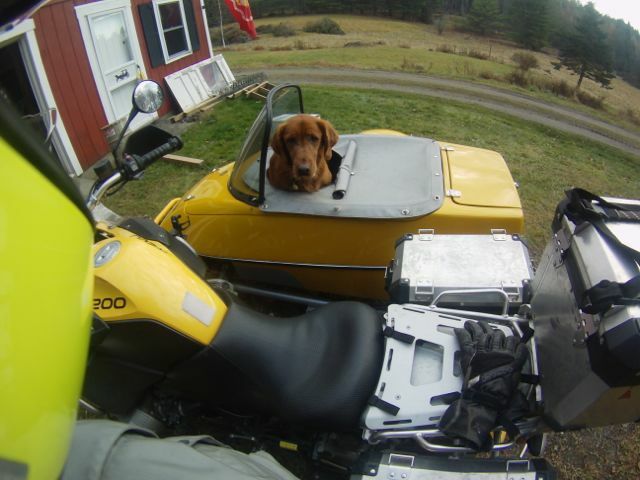 Tulliver began riding with me simply because he wanted to be with me, but his reluctance to remount after our play breaks had me thinking his heart just wasn’t into the whole sidecar thing. 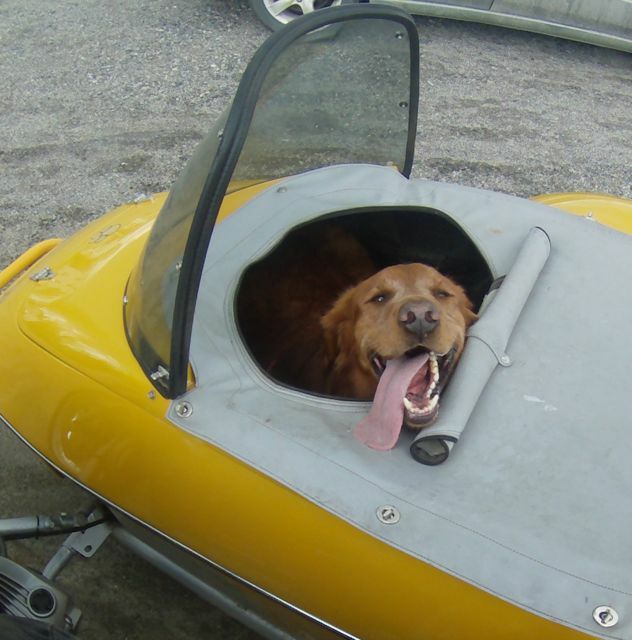 I was disappointed, and began to understand why long distance sidecar dogs were so rare. 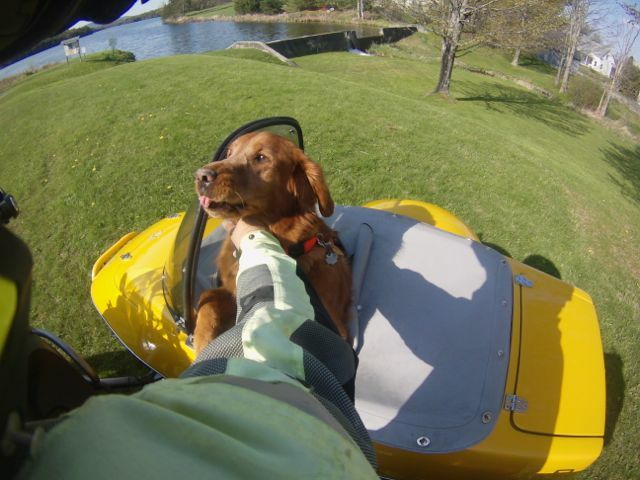 Perhaps some dogs were just born to it, and Tulliver was not one of them. And yet, it was Barley himself who taught me what patience and love can accomplish. Moreover, Tully’s ability to rest on the road might mean he would be less tired at the end of each day, more likely to enjoy the stops. His absolute focus on me holds the promise of not having to worry about him trying to greet dog-phobic people we encounter. His utter lack of prey drive means he won’t run down and kill every snake, rabbit, squirrel and mouse he sees or smells. 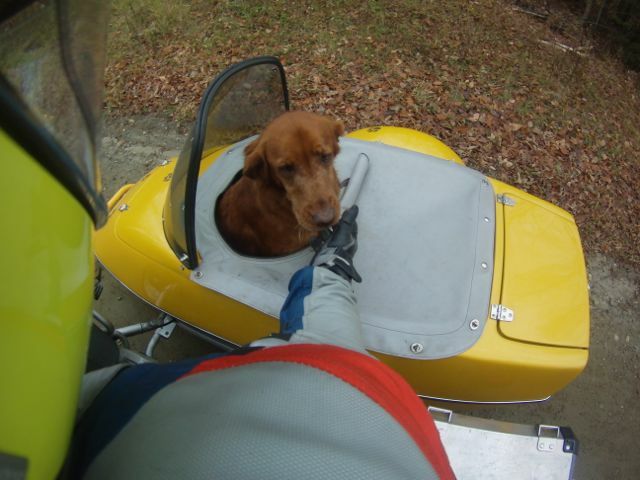 And, to be fair, his desire to be with me coupled with me following Barley’s admonition to break him in gently, to make every ride fun, seems to have changed his attitude about sidecar rides just a bit. 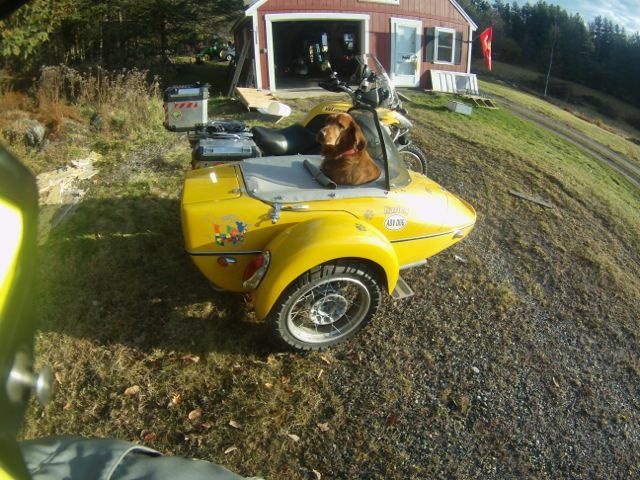 He still lays down a lot, but with his chin resting on the edge of the tonneau cover where he can watch me or the maple branches spanning the country lanes we ride. If I slow down or change direction he more often than not sits up to see what’s going on. And as we pass a body of water he leans out to catch the scents associated with lakes, rivers and streams. Tulliver trying not to be overwhelmed. 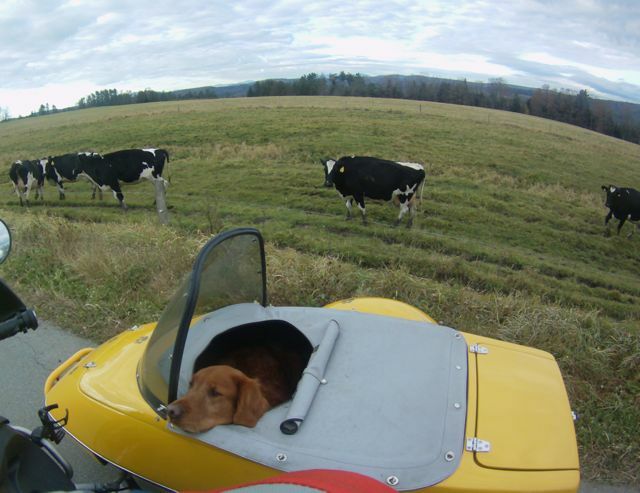 He’s settled down considerably and is working hard to be a good sidecar dog. 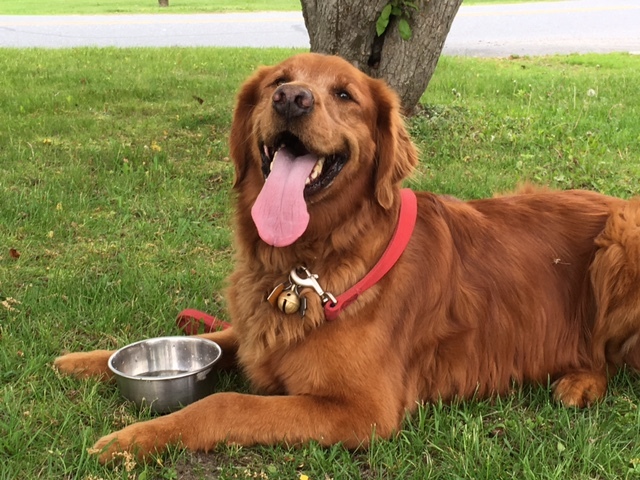 In my dreams I still feel the press of a big paw against my thigh, the warmth of a furry head gently caressed by my gloved fingers, still hear the happy woof of a dog that wants to be nowhere else but at my side…and I think that might just be Tulliver. Tulliver’s amazing tongue lolling out after a play break. Tully relaxing at a play break. The biggest challenge two months into his training is getting him to calm down enough to drink, critical on longer trips. The BMW Motorcycle Owners of America rally is in Hamburg NY next month. 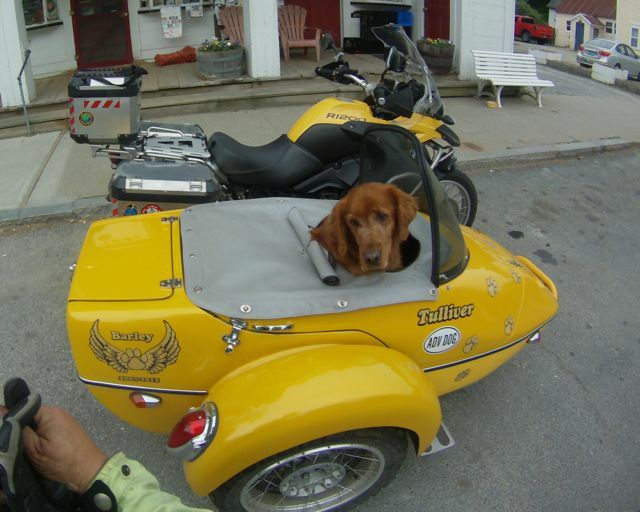 At just shy of 500 miles from home, it would have been an easy day ride with Barley. Since it’s Tulliver’s first rally I’ll plan on making it a two day transit with plenty of stops at streams and lakes to keep it fun. But it’s plain he wants to be where I am, so we’re both going. I’d better pull the camping gear out of the closet! 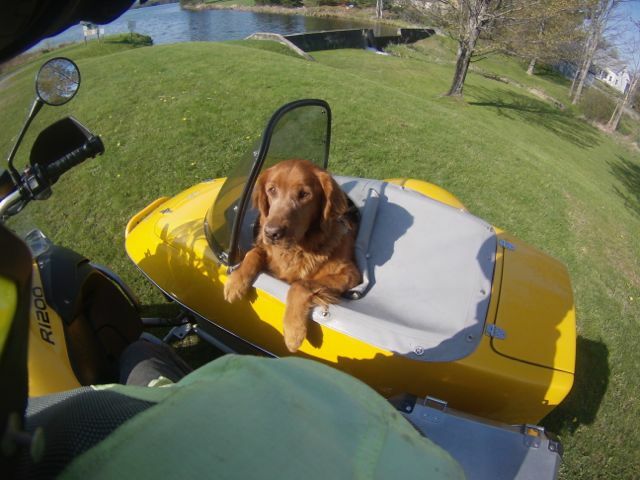 I always looked forward to seeing Barley at the Rallies and can’t wait to meet Tulliver! Safe travels and see you soon!